McCrary’s last second TD gives Panthers new life. 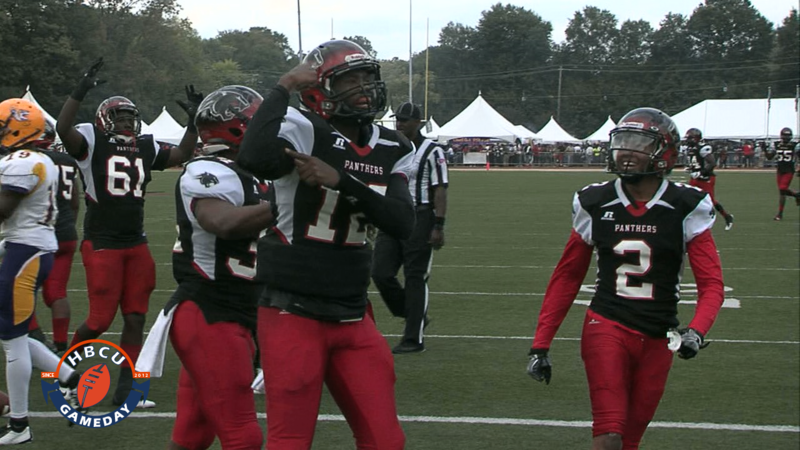 Clark Atlanta seems to have a thing for late game theatrics and game winning field goals at Panther Stadium. Reminiscent of the Morehouse game from last year the Panthers needed a late drive and then a field goal, this time in overtime, to beat Mississippi College 32-29 on Thursday night. The SIAC preseason player of the year Johnathan McCrary capped off a 15 play drive with a one-yard touchdown run as time expired in the fourth quarter. That touchdown and the ensuing extra point left the game tied at 29. Mississippi got the first possession in overtime but dug themselves into a hole and turned the ball over after facing a 4th and 24. Clark Atlanta was able to put together a short drive and win it with a 44-yard field goal by Carlos Saldana. McCrary finished the game going 24-42 with 253 yards passing, two touchdowns and one interception. McCrary was also the leading rusher for the Panthers after scrambling for 48 yards. The Panthers led 22-14 at the half before being outscored 15-7 after the break, with Mississippi just one play short of shutting CAU out completely in the second half. Clark Atlanta is in action again on Saturday, September 9th when they host Central State. A win against the Marauders would provide a little cushion for the three weeks that follow that game. The Panthers have a brutal three game road stretch at Tuskegee, at Lane and versus Grambling State in Chicago.